You know them well, those small, zippy birds that flap their wings so fast (80 times per second) and make a humming noise. Those beautiful birds with iridescent feathers that can fly right… left.. up… down… backwards… and even upside down. They also will hover over a flower, a feeder, or maybe even you especially if you have bright colors on, by flapping their wings in a figure-8 pattern. These lovely acrobats have a long bill that makes it easy for them to drink nectar from tubular flowers such as the hibiscus, bee balm, or the trumpet vine to name a few. Yet, they also love to come in to nectar feeders if you have them in your backyard. 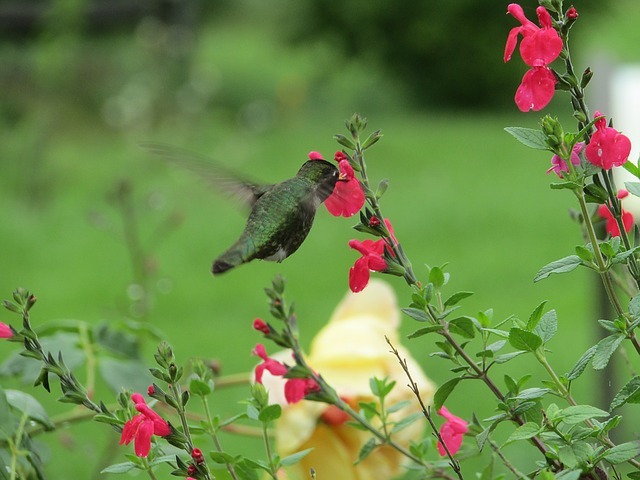 Yes, I am talking about the hummingbird…specifically the Ruby-throated which is the only hummer that we get in my neck of the woods in Kentucky (sometimes the Rufous Hummingbird has been known to show up in the fall but it is not common sighting). The Ruby-throated hummingbirds are commonly found in eastern North America, east of the Mississippi. 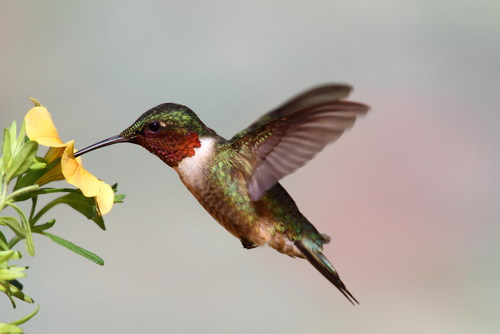 While the hummingbird loves nectar which gives them the necessary energy for their high metabolism, it’s diet also includes small beetles, weevils, flies, gnats, mosquitoes, aphids, mites, leaf hoppers, flying ants, parasitic wasps, spiders and daddy long legs. Consequently, having shrubs and trees in your yard helps them supplement their diet and also provides nesting places for raising their young. Water is another necessity which they use for drinking, bathing, and preening. So you have read all about this and have even made the effort to ensure that you have the needed supplies to attract these beautiful birds to your yard. But for some reason you only seem to get maybe one or two coming in throughout May and June, and then in July , August, and maybe a little in September, the hummers seem to be more abundant. Where are all the hummingbirds at in May and June, and why do I seem to have a steady flow starting some time in July? Let me tell you the reasons why…. The Ruby-throated hummingbird winters in the Gulf of Mexico or Central America and migrates to where I live in Kentucky in late April. More southern states get even earlier arrivals. You will generally see the beautiful males first with their brilliant iridescent red throat and bright emerald or golden-green back and crown. 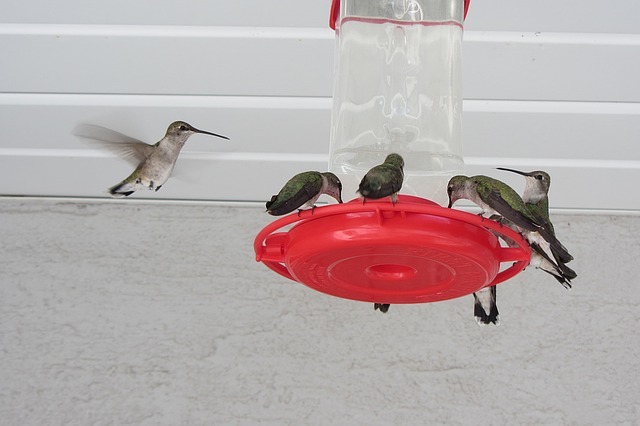 In the beginning of spring you may one of these migrating male hummers at your feeders. They come a few days earlier than the female so that they can establish territories to be able to court the arriving females at the beginning of the breeding season. 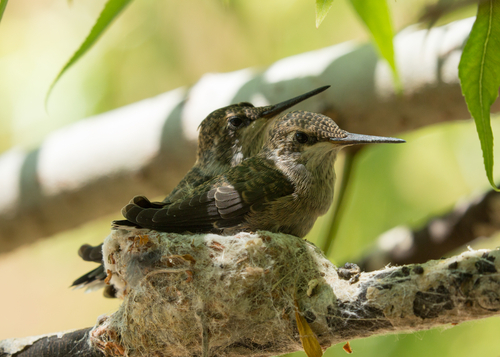 If you have a good habitat that meets all of their needs (diet, nesting, water supply) as mentioned earlier, the hummers will stay to raise their young. This is especially true if you have been doing it for a few years as some hummers come back to the same breeding grounds. Just a note: if they can survive their first year of life their life expectancy goes up and that could be up to six years and eleven months. If the hummingbirds stay to raise their young it can take five weeks to get even more in your backyard and at your feeders if you are lucky enough. Why Five Weeks You Ask? Once the male and female Ruby-throated have done their mating, the female wants nothing to do with the male and vice versa. So the male moves on to a new territory looking for another female, while the first female he mated with returns to her breeding territory. The female will then lay her eggs which is no more than two. The incubation period takes about fourteen to sixteen days and once the eggs hatch it will take another two to three weeks before the young leave the nest. The female may or may not have another brood depending on the timing of her first brood. So if you add all this time up you get about five weeks which takes you in to June. So your hummer count in your yard could be going up a little if the nestlings who are now full grown and can forage on their own, decide to stay in the area. In early July the males all start to migrate south. So you will probably start to see more males at your hummingbird feeders at this time. Then following them is a succession of southbound females and immatures of both sexes. Each day there will be different birds coming through which keep the supply going at your feeders and in your garden. At this point, if you have not seen any until now it is probably because your habitat is not appropriate for nesting (see introduction). 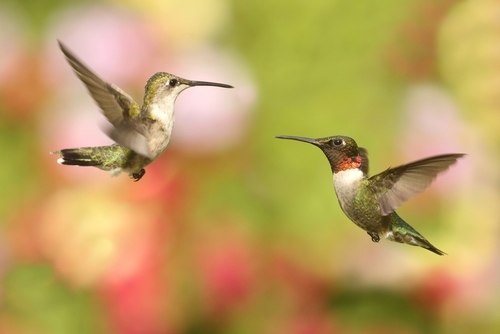 By August, which just started on Tuesday, you may be seeing ten to twenty hummingbirds at a time as they continue to move south, stopping in to refuel their bodies in the morning, then traveling during the day. Come late afternoon they are foraging again to maintain their body weight. While I do not get more than three hummingbirds at a time in August at any of my hummingbird feeders that are spread out in my landscaping, I do get them continuously throughout the day, every day. I can look out at any of my five feeders and be guaranteed to see a hummingbird or two. In September, peak numbers in really good habitats can have twenty-five to forty hummingbirds at a time and once again it all depends on the habitat where you live. If you want to attract the Ruby-throated Hummingbird to your backyard oasis you need to provide the necessary habitat for them. This includes tubular type flowers such as the hibiscus, bee balm, or the trumpet vine to name a few. In addition you should have hummingbird feeders, a good water source, trees and shrubs for nesting and also for providing for the rest of this bird’s diet of beetles, weevils, flies, gnats, mosquitos, aphids, mites, which can be found on them. Your supply of Ruby-throated Hummingbirds will begin to grow starting in the spring migration of around early April to late April then steadily growing to a good and steady supply up to twenty-five to forty hummingbirds by the peak time in September. Of course not everyone will get these high numbers but if you are lucky you will get a steady stream of them starting in mid-July when the males start to migrate south again then the females and juveniles following them. It is a never ending fun time to watch these beautiful acrobats as they zip around, flying backwards, downwards, and every which way in your yard. If you have any comments or questions about this post please feel free to do so below. I would love to hear from you. Posted in Attracting Hummingbirds, Hummingbirds, In The Garden and tagged attract hummingbirds, hummingbirds. Your article struck a interest in learning more about this amazing bird. Just love the hovering and darting they do so unbelievably fast. You article answered some questions I had about the habitat, nesting, etc. My experience with the hummingbird behavior in the last few years was outlined like a short story. Enjoyed it immensely. I will do more to attract them in the following years thanks to this article creating the impetus. Robert, thanks for your comment. I have been birding for about twenty years. I started out with just backyard birds and because of my fanatical birdwatching husband have caught the bug :-). Hi! Thanks for this delightful article on hummingbirds. I’m in Southern Ontario, Canada and the ruby-throated hummingbirds show up around the end of April depending on the weather. I put up several feeders quite a distance from each other as I’ve hear they are quite territorial. I’ve seen Youtube videos with like 5 or 10 on one feeder. That never happens here. They actually fight! I’m wondering if you know if there are an bird houses you can get for hummingbirds like those for a regular sparrow or do they just tend to build their nests in bushes and shrubs? Barb, thank you for your comment. Yes, it is a good idea to spread the feeders out as they do tend to fight each other. I have 5 of them spread out in my front yard and back and that seems to work. Right now there is a constant flow of them and I just love it. As for bird houses for them, I have read that a Ruby-throated will not use a bird house no matter what the color. 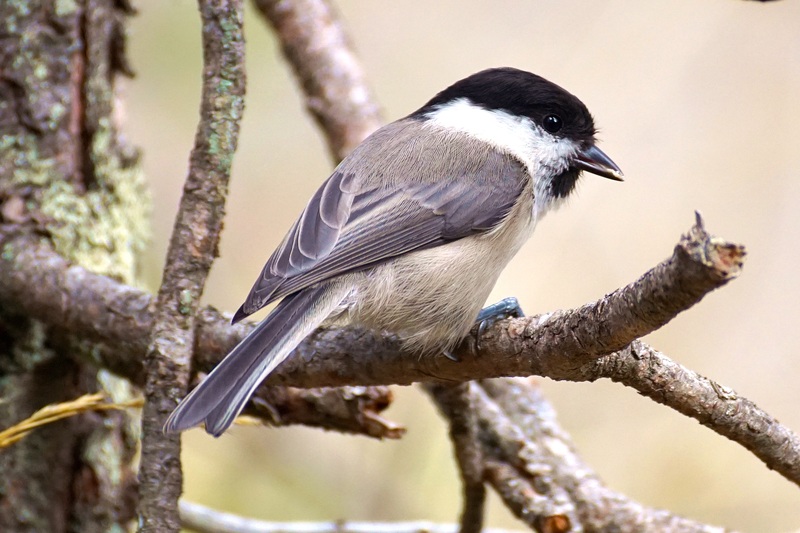 They tend to build their nests on a small twig in a tree. Yeah, I would love to be able to see them in a bird house too as it is really hard to see where they have their nests because they are so tiny.